Since the first release in mid-2017 of Stockport Local, our Community Groups Directory on the Council website, we have continued to add enhancements to it to offer staff, partners, and residents, a single place to find up-to-date information on community groups and services. 6. allowing groups to display details of their public events to a wider audience, with reciprocal links from the events calendar to a group’s page. Where groups belong to or are supported by a wider organisation or entity (such as Age UK or Greater Manchester Victims’ Services) we have created a view which allows the user to see all groups and/or services under their umbrella. It has always been easy for any group or service to add their own information to our groups listing using the ‘Add your group or service’ link on the home page. We have now introduced a management console for group owners, so they can keep their own page up-to-date, including entering and managing any events they run, for automatic inclusion in the Events calendar. Emails went out in February 2018 to over 780 group contacts and owners to let them know how to access the management console to update their own information. We have two roles within the management console, Administrator and Editor. An administrator has full permissions over the group content including adding additional administrators or editors without our intervention. They can also archive the group (if it will be temporarily unavailable but open again in the future) or delete the group. Editors, as the name suggests, just have permissions to edit the page. 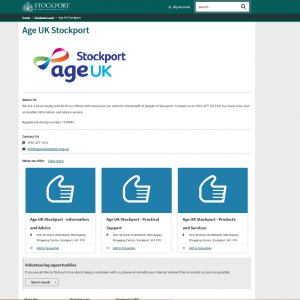 All administrators and editors need to register for a free My Account on the council website and then ensure that their email address is linked to their group or groups (this can be done via an existing group administrator or by emailing us at website.updates@stockport.gov.uk). One thing we just done recently is making sure that all groups and services are available from our main search engine, and in the coming months we are going to start looking to further improve the customer journey for finding a group or service on Stockport Local. We have received quite a lot of feedback that we will use as a basis for these enhancements and continue to go out and user test Stockport Local in the communities and with service providers to make sure it continues to meet their needs. One of the first enhancements will be a new homepage with quicker and easier access to group information, useful guides for users trying to find a group or service, and for group administrators/editors in making the most of the management console. The email to group owners in February this year also triggered the start of our auto-archive feature which sends reminders to group administrators and editors if a group hasn’t been updated in 3 months (May 2018), followed by an automatic archive status for groups not updated after 6 months (August 2018). Automatic archive just means that the group will no longer be visible to the public, but it can be re-instated at any time if required. This ensures that Stockport Local keeps information as up-to-date as possible.